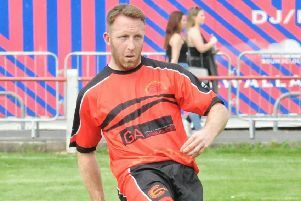 Garstang FC return to cup action on Saturday with manager Lee Baker grateful for back-to-back free midweeks. The Riversiders travel to Avro in round three of the Macron Cup, looking to bounce back from Saturday’s loss at Chadderton. Two weeks without a midweek game have given Baker’s squad a much-needed rest after five consecutive weeks of weekend and midweek fixtures. It was the prelude to a busy December with seven league and cup games, featuring consecutive Wednesday matches starting on December 19 with the Lancashire Challenge Trophy tie against Southport. Baker said: “We’d played Saturday, Tuesday, Saturday, Wednesday, Saturday, Wednesday for as long as I can remember. “It meant that when we played AFC Blackpool, we were shot and the players’ legs had gone. “Six of their lads came back in and we looked like we got physically bullied a bit – and that’s the first time I could say that because, on another day, we can compete with them. “I know I was sick of bad weather last year but I’m doing rain dances at the minute and hoping I can get or two faces back. Two of the principal absentees for the Riversiders this season have been at either end of the pitch. Centre-half Josh Westwood and striker Alan Coar have been out with injuries but there may be better news on the horizon. “Josh is back in the loop and doing some straight line running but I don’t want to rush him,” Baker said. “I’m looking at Christmas at the earliest for him and Alan is saying he wants to be back before Christmas. “We know what he’s like, he will play on one leg because he’s that type of lad.